As the autumn leaves begin to fall across North America, the Converting Quarterly staff is putting the finishing touches on our 2011 Quarter 4 issue, which features a Market Focus on Nanotechnology and a Market/Technical Focus on Vacuum-Coated Materials. 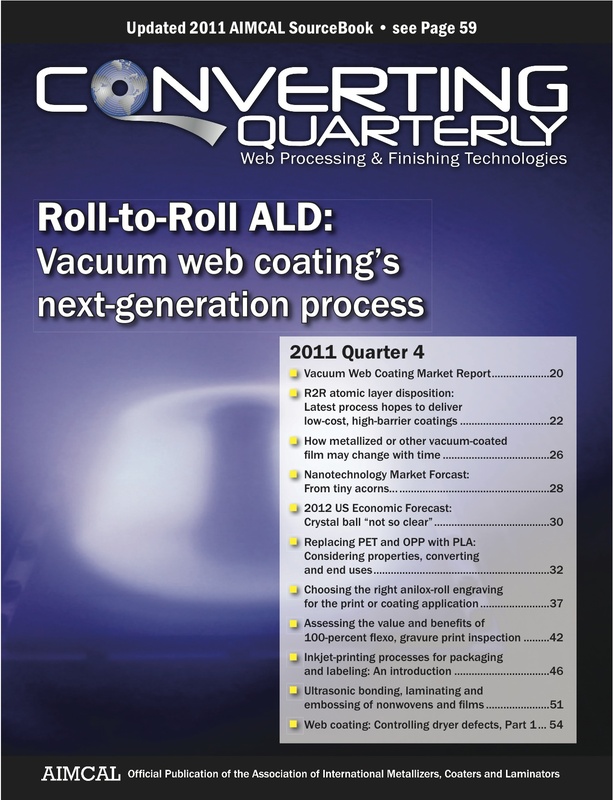 Atomic Layer Deposition: Vacuum web-coating expert Dr. Charles Bishop will report on new developments in roll-to-roll ALD: the latest process hopes to deliver low-cost, high-barrier coatings. He predicts that the first large-scale production machines are only a few years away. Nanotechnology Market Forecast: With an overall projected growth rate of 19 percent a year, nanotechnology will soon enter the consumer market in myriad ways. Nano-enabled food and beverage packaging will provide improved mechanical, barrier and anti-microbial properties. Three Package-Printing Technical Papers: Topics include how to choose the correct anilox-roll engraving for your flexographic-printing and coating applications; assessing the value and benefits of 100-percent print inspection for wide-web flexo and gravure production; and web-fed inkjet printing developments for packaging and labeling. “Green” Substrate Technical Report: Replacing PET and OPP films with new eco-friendlier PLA (polylactic acid) substrates requires new considerations of the film’s properties, its downstream converting differences and end-use applications for foods and non-food products. 2011 AIMCAL Sourcebook: Use this upgraded edition of the association’s annual directory listing all member companies, along with a detailed breakdown of member converting capabilities and products, and suppliers of machinery, equipment, materials and accessories. Five Technical Q&A Columns: Get the answers to questions on atmospheric pumping for the vacuum-deposition process; controlling film-to-film separation by specific formulation choices; the advantages of the curtain coating method; common slitting-blade metals; and defect classification and naming. This entry was posted in coating/laminating, digital printing, flexible packaging, package printing, slitting/rewinding, sustainability and tagged bioplastics, converting, flexible packaging, flexography, gravure, ink, nanotechnology, packaging, plastic film, printing, source reduction, sustainability. Bookmark the permalink.